We envision a thriving, carbon-based industrial ecosystem that is meeting the material needs of humanity while also sustaining a stable, healthy environment. Accelerate the transformation of our industrial ecosystem to one that turns gigatons of carbon pollution into durable products by capturing and converting it to carbon-based materials useful in advanced manufacturing. 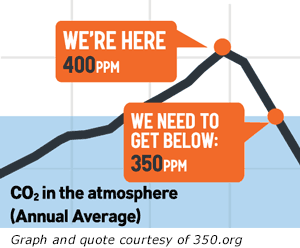 The current level of CO2 in Earth’s atmosphere is for the first time over 400 parts per million. CO2 is vital to life on earth. A miniscule proportion of CO2 in our atmosphere (only about 275 ppm since the beginning of human civilization) is enough to maintain the conditions for life. However, carbon-fueled energy production, manufacturing, and transportation are now pushing CO2 levels far past the point of danger. The aim of the Carbon Trifecta is to convert the overabundance of CO2 from an existential threat to a business opportunity that can lead to a sustainable global economy. Implementing the Carbon Trifecta will require a focused collaboration among scientists, technologists, business leaders, policy-makers, and ordinary citizens around the world. Convert carbon dioxide to a suite of highly functional nano-carbon (e.g.graphene) products at large scale and at a cost in the lower end of the price range of industrial carbons. Work with industry to create commercial products based on this abundant new source of highly functional material. In particular, focus on developing robust 3D printing materials, thus enabling the transition from globally outsourced mass production to locally sourced customized production. The Carbon Trifecta solution combines the re-use of carbon dioxide with support for a global transition to an economy driven by computing, software and 3D printing. The ​mission of the Carbon Trifecta is to build a scientific, corporate, and political community dedicated to building a new, carbon-built industrial economy. The solution? A newly isolated material named graphene, with extraordinary and valuable properties. It is now possible to produce graphene from carbon dioxide (CO2) at industrial scale with a projected production cost nearly an order of magnitude less than the alternative production technology. As a result, we can now contemplate the conversion of gigatons of CO2 into graphene, and the large-scale manufacture of graphene-composed objects ranging from buildings and vehicles to electronics and clothing. There is room at the Carbon Trifecta proprietary and open-source table for every university, company, and country. In fact, without wide-scale international cooperation, the plan won’t work. Rich countries and poor; China and the US; the EU, UK, and Australia; companies in technology and finance, utilities and chemicals; universities, think tanks, governments, laboratories, and individuals, can all be productive partners in this new program. The work of Carbon Trifecta is to create, support, and orchestrate global networks and collaborations in support of this mission. Carbon Trifecta International is a 501(c)(3) nonprofit organization, EIN# 81-4771460. Our mailing address is P.O. Box 1969 38 Yew Lane, Friday Harbor, WA 98250. Unless otherwise indicated, all content on this site is licensed under Creative Commons 3.0 US License.